The subject matter is a method to determine the emission values of road transport. The certification process includes analysis to verify if the emissions that are calculated by the software are correct. The design and development processes of the company are audited as well. 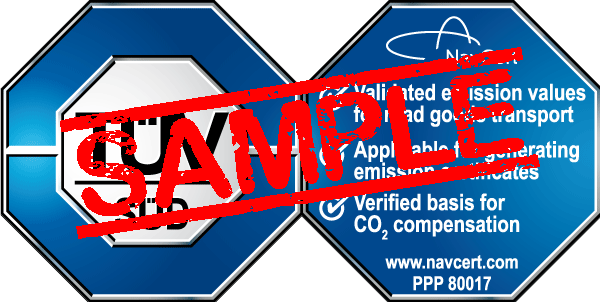 The certification mark is issued within the scope of voluntary certification based on the HBEFA 3.1 (Handbook Emission Factors for Road Transport) and on further predefined criteria. Certain routes with different criteria (speed limit, ascents etc.) are defined as examples to ensure accurate analyses. Furthermore, different vehicle types and their characteristics (weight, bodywork, emission class etc.) will be taken into account for calculation. The manually calculated results are then compared and evaluated with the values calculated by the software. For validation of the emission values, the results were calculated manually with the help of the basic data provided in the HBEFA 3.1 standard and compared with the results for certain routes and vehicle types computed by the software. The software is also helpful when applying for emission reduction certificates. Certification verified that all necessary data is calculated, published, and safe from manipulation. The software-computed CO2 values were compared with the results of manual calculation. The manual calculation was thereby based on the basic data provided in the HBEFA 3.1 standard. This examination showed that the calculation algorithm worked correctly.